Blimey, you can't keep a good alt-country-rock band down can you? Midlake, as we have previously reported, are coming to our shores next year but just can't seem to stop adding yet more tasty dates to the gigging plate, so to speak. New shows have been announced in Stoke (Sugarmill) on January 25th, Southend (Chinnerys) on the 26th and Liverpool (Williamson Tunnels) on the 30th. The complete list of dates is below as a reminder. 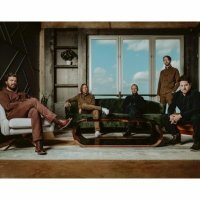 The band will play tracks from their next Bella Union album, "The Courage Of Others", due for release on February 1st and to bolster up the intricacies of the new songs, Midlake will expand to a seven-piece for the tour. Two new temporary members will provide flute, piano and electric guitars. Judging by recent interviews, the band have been listening to plenty of British Folk and ECM Jazz prior to and during recording sessions for the new songs. Anyway, tickets for the new dates are on sale now.